Green Fleet – What’s That? The Green Fleet is for new or “Less Serious” racers! Are you new to sailing or sailboat racing? Are you trying to build a new crew to campaign next year? Are you crew that wants some experience before stepping up to the big leagues? Do you like to go sail with friends but want a little less pressure? Is the most important thing on your boat your snacks? Then the green fleet is for you! For those who don’t know me, I’m Rob Gibbs. 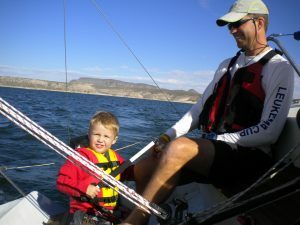 I’m a US Sailing Certified Small Boat Instructor, a dinghie racer, a father of 2 and a husband of 1, and a guy who, up to this point, went sailing with his buddies and left the family at home. Now that the kids are bigger and the wife is willing, we’ve got a bigger boat and “have fun and learn something” attitude. Together with Emory Heisler (at TTL) our goal with the Green Fleet is to lower the barriers to entry to the sport we have come to love. What that means to you is up to you! If you have kids and resisted racing with the family, no more excuses! If you want the opportunity to get out and practice in a safe, monitored environment without the pressure of racing, here’s your chance! We’ll get together on Sat mornings (if you want) and introduce/review sailing concepts like Points of Sail & Trim. We’ll go over the Rules of the Road, how to start, what the course chart is here and what it might be somewhere else. If you have specific questions or topics you want covered, let me know! Also, if you are crew and would like to secure a spot on one of the boats, please let me know. There are some open positions I know of right now and there might be more as the season goes on. My email is RobDaSailor@gmail.com. For more information, check out the Green Fleet Page or just come sail with us! Opening Day 2011 – Order Your Shirts Now!